The trail now follows the edge of the river, and a sign about dragonflies and damselflies, the odonates, suggests that there will be lots to see in the summer months. 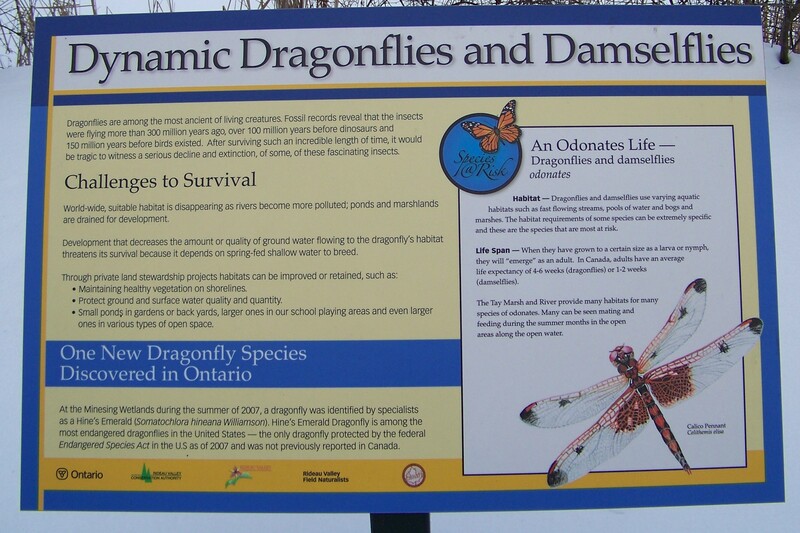 As noted in the sign, odonates are threatened, as are many, many species, by the loss of suitable habitat. The polluting of waterways and draining of wetlands take a huge toll on wildlife. 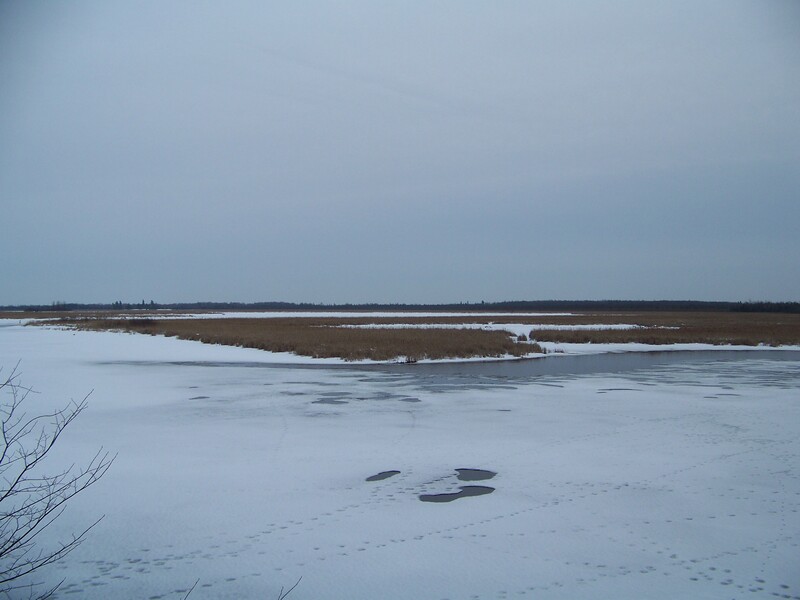 Two-thirds of Ontario’s wetlands have been lost or severely damaged and many surviving wetlands are threatened. 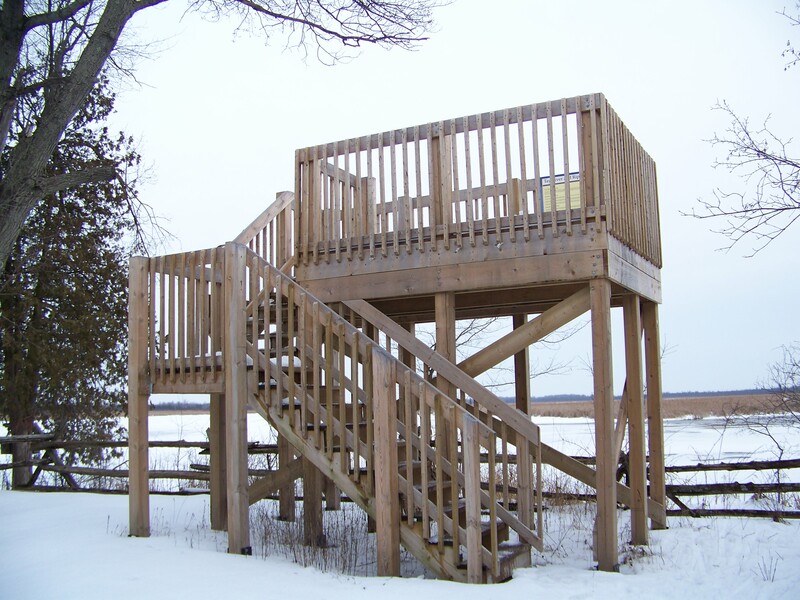 The highpoint of the hike, both literally and figuratively, was the marsh lookout. Sturdily constructed, it offers a beautiful view out over the Tay river and marsh. 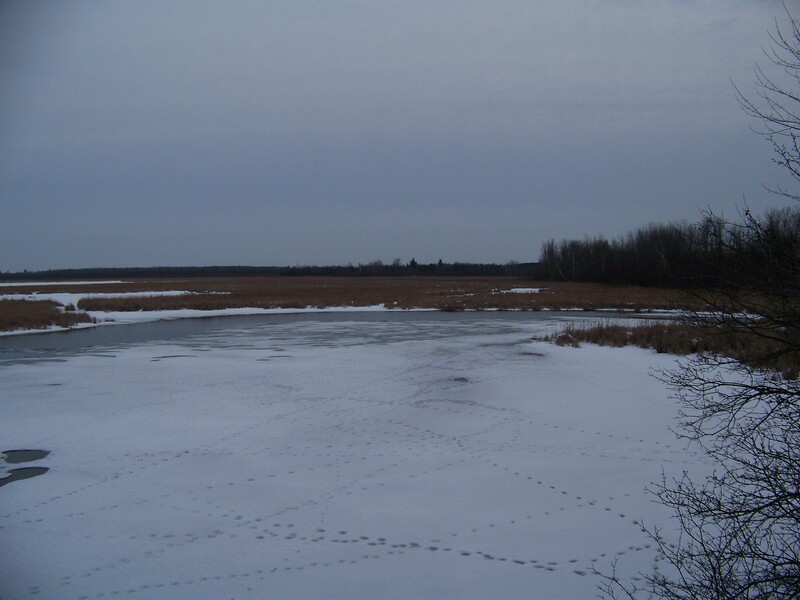 Even at this time of year, you can see signs of life, as tracks crisscross the ice surface. It is always wonderful to see a large marsh or swamp. Wetlands are vitally important, filtering out sediment and pollutants, cleaning the water we all depend on, and providing habitat for a wide range of plants and animals. 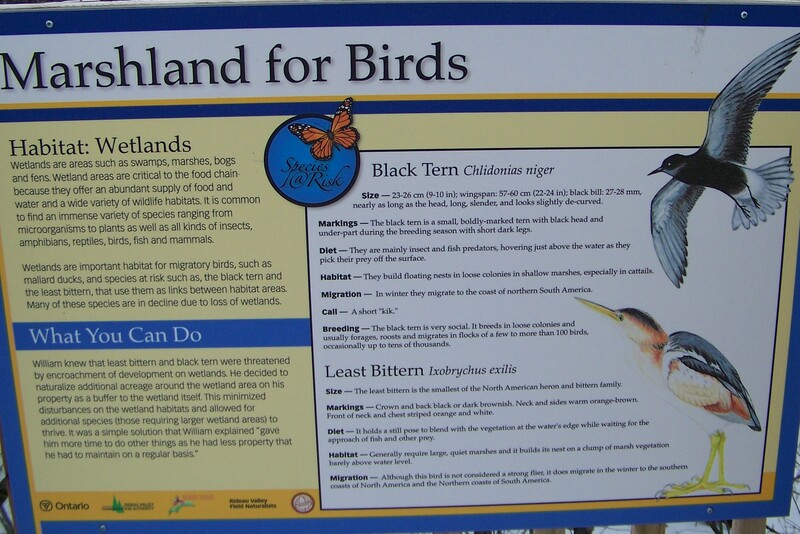 A sign on the lookout highlights Black Terns (Chlidonias niger) and Least Bittern (Ixobrychus exilis). Again, it isn’t clear whether these species nest at this location or they just hope they will! The Black Tern breeds mainly on the prairies of North America, but its range extends east into western Quebec. During breeding season, it uses freshwater marshes, but from October to April it winters by the sea, mostly on the Pacific and Caribbean coasts of Central and northern South America. The Least Bittern was considered abundant in large southern Ontario marshes a century ago. It’s decline has matched the destruction of its habitat as marshes are drained. Jebb’s Creek, a tributary of the Tay that winds through the reserve, provides important spawning and nursery habitat for fish. With the mild weather, the ice had melted back and revealed some open water. Other wetland residents who have suffered mightily for the sake of “progress” are Ontario’s turtles. There are eight species of turtles in Ontario. The Painted Turtle (Chrysemys picta marginata) is the most common and widespread species. Snapping Turtles (Chelydra serpentina) are still present in significant numbers but are vulnerable in some areas where populations were once stronger. 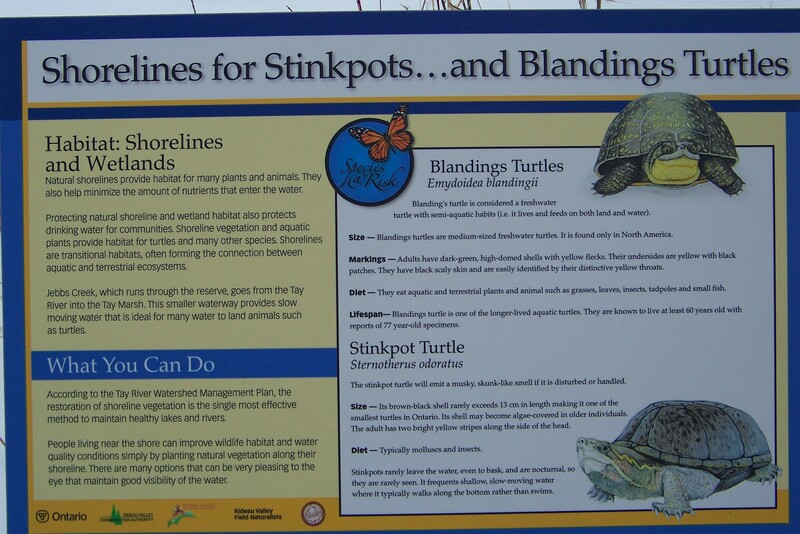 The remaining 6 species (Blanding’s, Musk or Stinkpot, Map, Spotted, Spiny Softshell, and Wood) are all in trouble, listed as threatened or endangered. Threats to turtles include the loss of wetland habitat, road mortality, pollution, collection as pets, and predation. These pressures may soon overwhelm these important wetland ecosystem members. Amongst the cattails of the creek and wetland, several nest boxes for Wood Ducks (Aix sponsa) could be seen. Wood ducks are thought by many to be the most beautiful native ducks in North America. [For some lovely photos of a wood duck pair, visit Evening Stroll at Xenogere.] They nest in the cavities of trees close to water, but a good cavity can be hard to find. Conservationists have sought to help the wood duck population by providing nesting boxes in wetlands. Some of the Reserve’s boxes were the standard wooden boxes, but there was also a plastic style, which I haven’t seen before. In checking on them via the internet, I found that they have pros and cons. The plastic boxes are sturdy and can be made from recycled plastic, but it seems that at least one study has found that the ducks are traditionalists. This study by H.W. 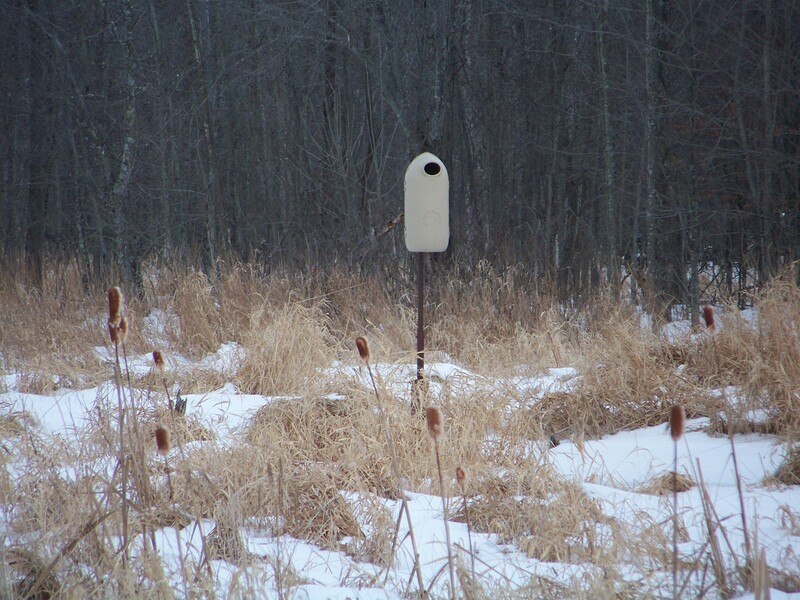 Heusmann and T. Early suggests that wooden nest boxes are preferred, but the study is dated 1988, and perhaps newer plastic boxes have a more appealing design. 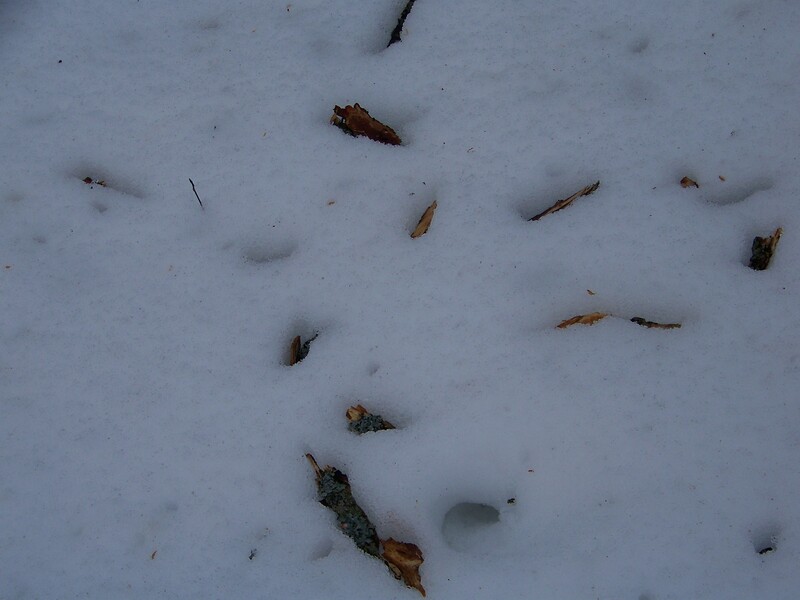 Farther along the trail, we noticed these wood chips on the snow, causing us to look up for the source. 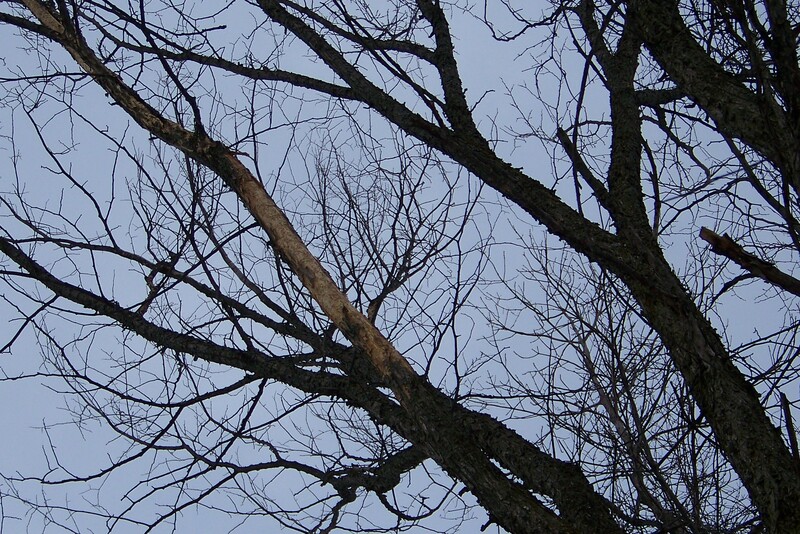 A branch has been stripped of its bark. At first, we thought it was the work of a porcupine, but on closer examination of the branch with her binoculars, Birdgirl concluded a woodpecker was the culprit. The last section of the trail meanders along the edge of open pastureland. 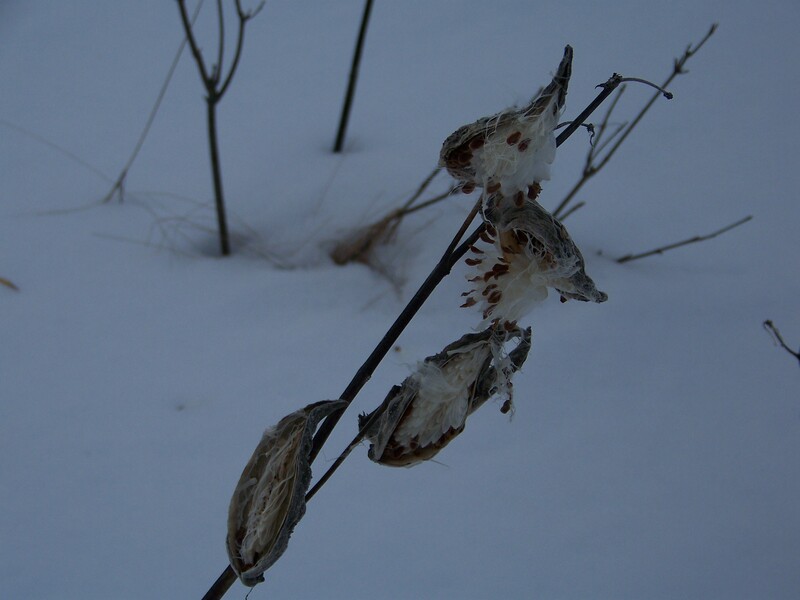 The field was dotted with milkweed. I was surprised that many of the pods still contained their downy seed packages. 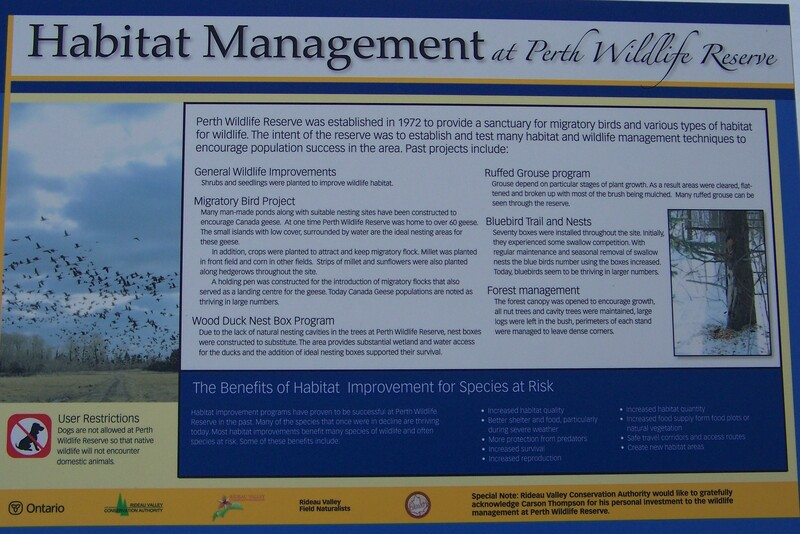 Back at the parking lot, we looked over the Reserve’s management initiatives as outlined on their visitor information sign. The Reserve was established in 1972 and their comments on encouraging the Canada geese population suggest this sign was written some time ago. These days, you are more likely to hear of efforts to discourage the now-numerous geese. In all, it was a pleasant, easy hike for a winter’s afternoon. 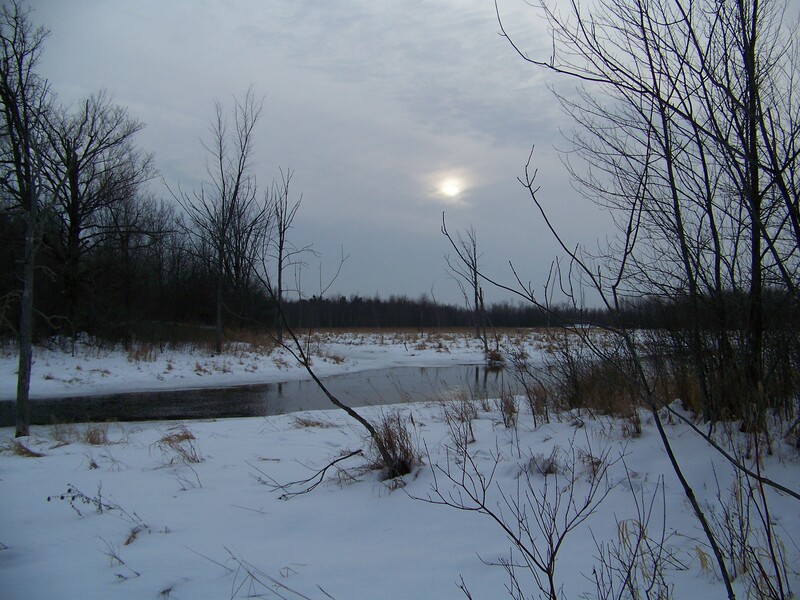 It will be nice to revisit the trail in the spring when the wetland sleepers reawaken. The footprints across the ice struck me as eerie for a moment, until I realized what was wrong: they’re all in straight lines. Little dogs in snowy backyards will have no part in straight lines! I guess there is nothing like an empty stomach to give you purpose and direction in life!